We visited Toro-chaya located at the entrance of Mt. Futatabi with holding our daughter in my arms to have Chinese noodle, omelet and beer. Probably we haven’t visit here since last spring. Although autumn leaves in Sasayama have been falling off even at the end of November, those at the foot of Mt. Futatabi in Kobe still red beautifully. We’d like to climb up to the top of it when our daughter is able to to holds her head up, and have some lunch with beer at the restaurant just opened last summer. When she grows more, we’ll lead her walking to Toro-chaya and lead her to the top when she grows more. And wish she’ll drinks beer with us when she grows enough!!! Mountains in Kobe is very useful for “everyday use”. They make us notice of the things that have changed since they stay without changing. 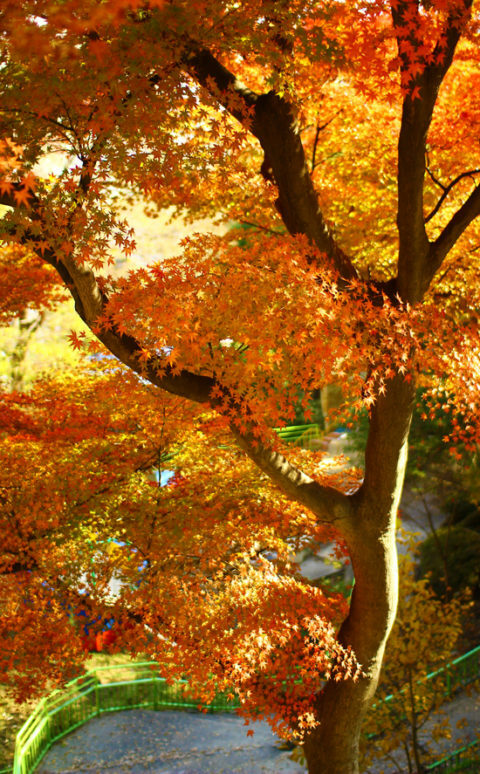 Photo: Maple trees in Suwayama park.